Sikhye is a traditional Korean beverage made with barley malt powder (yeotkiereum 엿기름) and rice. The taste is sweet and cold, with its own particular subtle flavor coming from barley malt. I love sikhye because of the flavor! Without the flavor, it will be like a bowl of sweet water and rice. When I lived in Korea, one day I gave sikhye to my American friend. I remember what he said at that time after sipping a little sikhye. “oops! What is this!… it looks like cereal with sugar water and the taste is kinda weird!” : ) I thought it was very funny, I could put myself into his shoes. I may feel the same way if I taste something very new to me and I find it’s totally different from the taste that I expect! Don’t expect the taste of a bowl of cereal with sugar water! Put 1 package of barley malted powder (1 pound) in a large basin and mix it with 24-30 cups of water. Let it sit for 2 hours until all the dregs are sunk to the bottom of the basin. Make rice and set it aside. Wash 2 cups of short grain rice. Drain and put in a pot with thick bottom. Pour 1.5 cups of water into the pot. Soak it for an hour and close the lid. Bring the pot to a boil over medium heat for 10 minutes. Open the lid and turn the rice over with a rice scoop or spoon. Simmer it over low heat for another 10 minutes! You will have nice fluffy rice! When the mixed liquid of barley malt powder and water is completely separated (it takes about 1.5 hours-2 hours), pour the clear liquid from the top into your rice cooker. *tip: if you have leftover clear liquid, save it and keep it in the refrigerator. We are going to use it later. Add 1 cup of sugar and the cooked rice. Stir it and set the rice cooker’s function to “warm” for 4- 5 hours. Be sure not to set it “cook.” The reason for setting it to “warm” is to ferment the rice so that the starch from the rice converts to sugar. If you boil it, the fermenting process will stop. Throw out the sediments sunk on the bottom of the basin. 4 hours later, check to see if the rice is fermented or not. When the rice is fermented, a few grains of rice will float to the top of liquid. Strain the rice and rinse it in cold water. Set it aside in a container. Add a little cold water and keep it in the refrigerator. Transfer the liquid from the rice cooker to a large pot, and add the saved leftover liquid from #3 if you have it. Add 1 cup of sugar and bring to a boil. * tip: you can add more water and sugar if you want. Remove the foam floating on the top of the boiling liquid. Cool it down and transfer it to a glass jar or bottle and keep it refrigerator. To eat, serve it cold in a bowl with a scoop of rice from #8. Drop in a few pine nuts, just before serving it. * tip: you can add crushed ice made with sikhye liquid. If you like all your rice grains to float, add 1 tbs of sugar and mix it right before serving it. Posted on Monday, February 9th, 2009 at 8:51 pm. Last updated on April 26, 2015. Posted June 1st, 2015 at 2:02 pm | Log in to reply. Hi maangchi.. can i make shikye without sugar? How long it last in the fridge? Posted June 2nd, 2015 at 11:59 am | Log in to reply. yes, you can make without sugar. It will naturally tastes a little sweet. You can keep for a week in the fridge. Good luck with your Korean cooking! Posted May 2nd, 2014 at 8:02 am | Log in to reply. Posted May 4th, 2014 at 11:44 am | Log in to reply. It sounds like you made perfect shikhye! Yes, I like my shikhye less sweet with full malt flavor, too! “..right before serving I can sprinkle a bit of sugar to the drink and then add the rice, amazingly all the rice float,” yes, that’s right! Congratulations! Posted December 22nd, 2013 at 9:16 pm | Log in to reply. Hi Maangchi – I love your Shikhye recipe which is super easy. I am wondering how to make the cooked rice float a lot when serving as I tried twice which all cases the rice sank more than floating. Appreciate your advice on this. Have a great festive season. ps – I will be making this dessert for the New Year as my son is here from UK to spend time with us. Posted December 22nd, 2013 at 10:47 pm | Log in to reply. Just before serving, add 1 teaspoon sugar and stir it, then all the rice will float. Posted July 5th, 2013 at 4:32 am | Log in to reply. Do you know by any chance exactly at what temperature should this mixture be kept to ferment successfully? I’m asking that because I found out that my rice cooker’s keep warm temperature is 70 C. This would be too high for making yogurt for example (I can adjust this temperature to 50 C). I was thinking that same applies in this case, and I need to lower the temperature, if I don’t maybe the rice won’t ferment properly. In any case I will try this recipe with lower temp first and see how it goes. Posted July 7th, 2013 at 1:53 pm | Log in to reply. I have never measured the temperature when I made shikhey but I think I should do next time I make it again. Let me know about your experiment. Posted July 30th, 2014 at 6:47 pm | Log in to reply. Posted June 12th, 2013 at 6:01 am | Log in to reply. I tried making this and it didn’t work. I followed the recipe but 5 hours later the rice didn’t float. what did I do wrong? Posted June 16th, 2013 at 9:38 am | Log in to reply. The first time I made Sikhye it came out just like in the video, using a Korean Malt Powder I purchased from ebay. However because the malt powder was expensive I looked for an inexpensive alternative, and used a US made malt powder meant for baking or home beer brewing. I experienced the same results; the rice would not float to the surface even after 6 hours. I am going to go back to the previous malt powder I used. I found another seller who sells the barley malt in its raw form but one package is $18US! I found in my local Korean super market “Barley Malt Tea” I wonder if I could use that instead? Posted June 3rd, 2013 at 12:43 pm | Log in to reply. Posted March 25th, 2013 at 11:41 am | Log in to reply. At our favorite Korean restaurant they serve the Rice drink as complimentary dessert, and seeing how my children loved this dessert I had to try it myself. WOW! I instantly liked it! I am so grateful you did an excellent job in making the video on how to make Sikhye. I was very intimidated in making the Rice drink, but following your video I was successful! Last night I made my first batch. It came out exactly how our favorite restaurant makes it! I can understand why you insist on using a pot with a thick metal bottom to cook the rice, I observed you don’t need to use too much heat to get fluffy rice. I prefer glass over plastic pitchers, but having 5 children makes glass pitchers a hazard. Can drinking Sikhye everyday be unhealthy for you? My wife thinks so because of the sugar content, what do you think? Posted March 26th, 2013 at 12:27 pm | Log in to reply. Wow I’m surprised and happy to hear that your children love the taste of shikhye because not many Korean children love it. : ) The only reason not to drink it everyday is because of the sugar. “I tried the canned Sikhye and it tasted terrible! Nothing like homemade Rice Drink” yes, that’s right! Posted March 29th, 2013 at 3:25 am | Log in to reply. This morning I went to the local Korean supermarket to look for Malt Powder, and found a package that said it was Malt Powder but the contents looked like Malt barley in its raw form, can I use this instead? Do I need to put it in a blender to get it down to fine powder? Posted March 31st, 2013 at 9:11 pm | Log in to reply. Yes, you can use it, and you don’t need to put it in a blender. Just mix it with water and strain. Posted February 26th, 2013 at 8:35 pm | Log in to reply. I love this drink. I make it for my boyfriend all the time and he drinks about a liter every 2 days!! It’s very important to let the fermentation process happen for at least 5 hours in my opinion. I once made it rushed, and only let the shiikhye to ferment for 3.5 hours and it tasted so bland!!! Thank you for the recipe Maangchi!! :) I would have never discovered how to make that can drink I spent like a dollar per a can for!! Posted February 26th, 2013 at 9:24 pm | Log in to reply. Posted May 19th, 2012 at 10:05 pm | Log in to reply. Doesn’t boiling the liquid in the end kill any beneficial bacteria in the drink? Thanks so much!!! Posted November 16th, 2011 at 1:34 pm | Log in to reply. Posted August 11th, 2012 at 6:39 pm | Log in to reply. Posted October 7th, 2011 at 9:54 am | Log in to reply. Hi Maangchi, I’m so excited to try this recipe but I don’t have rice cooker :( Can I just boil it in a pot? Thank you! Posted August 9th, 2011 at 11:13 pm | Log in to reply. I personally LOVE shihye which I have indulged from my youth..
Posted June 30th, 2011 at 2:18 pm | Log in to reply. 1) Do you know if Barely malted powder is like the stuff Chinese use for their sikhye? 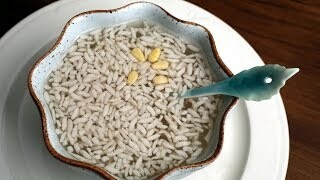 2)After cooking the rice(before fermenting it) should the rice still be a little bit hard to chew on? 3)After I fermented the rice the water tasted like rice water and I didn’t sense anything special with the smell. What did I do wrong during this process? Posted March 29th, 2013 at 3:15 am | Log in to reply. I used the Chinese Malt Powder for this recipe and it came out great! Posted June 28th, 2011 at 5:30 am | Log in to reply. Posted June 28th, 2011 at 8:31 am | Log in to reply. yes, it is supposed to be a little sweet. You can keep it for 4-7 days in the fridge. Don’t forget it will still ferment in the fridge. I usually finish eating it in a few days after making. Posted June 17th, 2011 at 12:15 am | Log in to reply. thanks for your generous heart!!!! i am trying to reduce refined (white/brown) sugar as much as possible….so…for the sikhae…can we use honey or agave nectar or maple syrup…etc…or even raw sugar? Posted June 17th, 2011 at 9:09 am | Log in to reply. Raw sugar sounds good to me because it won’t change the flavor of shikhye. This recipe was originally posted on February 9, 2009 at 8:51 pm by Maangchi. It was last updated on April 26, 2015. The video was watched 349,599 times on YouTube & has 2,362 likes!